Not to be outdone by the TORT Centre’s departing BMSc students, the successful MCh (Orth) students sent a surprise food hamper to the TORT Centre on 11 June 2018. All associated with the course would like to thank each and every student for such a kind gift, which will keep tea-breaks sustained for months to come! 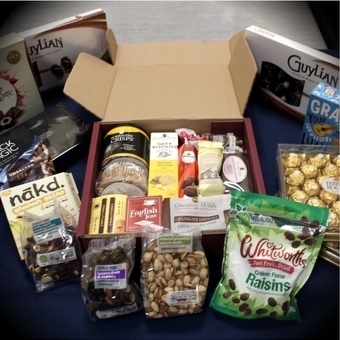 “On behalf of myself and all the staff here at the TORT Centre I would like to thank you for the lovely hamper. This gift to staff shows your obvious appreciation for all they have done for you during your studies over the academic year. We are a small but efficient and dedicated team and it is always a huge boost to be appreciated and thanked. It is with great pride that I can call you our ‘Silver Anniversary Batch’ on this, the 25th year of the course. You are now part of the TORT family and I regard you all as our MCh (Orth) ambassadors. You should be extremely proud of what you have achieved. Please do stay in touch if you can, and remember, we are always here if you need us. Thanks again for the lovely gift and we promise to set some aside for Sadiq to enjoy come Eid celebrations, although ... the almond and chocolate chunk Biscotti are ALL MINE!"